Washington's sleepy Whidbey Island is a great place to wander, drive around, and stop wherever grabs you. Whidbey Island is a small island community outside of Seattle. While there are several small towns and village on Whidbey, the island is home to three major towns—Oak Harbor, Coupeville, and Langley. All three are situated on the water, making for scenic views everywhere you look. Regardless of which town you visit, while on Whidbey Island, you'll discover interesting history, delicious local foods, unique shops and galleries, picturesque gardens and farms, and water, island, and mountain views in every direction. You'll also have the chance to enjoy a full range of outdoor recreation, including hiking, kayaking, and boating. Stunning views, great hiking, miles of shoreline, and extensive camping facilities make Deception Pass State Park one of the most popular state parks in Washington. The historic Deception Pass Bridge connects Whidbey and Fidalgo Islands; be sure to stop at the viewpoint and walk onto the bridge to take in gorgeous water and forest scenery. Like the bridge, Deception Pass State Park spans the two islands. Agriculture is part of Whidbey Island's heritage; you'll enjoy the pastoral beauty of the island as much as the water and mountain views. You can visit Meerkerk Rhododendron Gardens during peak bloom from April through May, have a slice of Loganberry pie at the Whidbey Pies Cafe at the historic Greenbank Farm, or shop (and admire) the lavender at ​​Lavender Wind Farm. Surrounded by natural inspiration, it's no surprise that many artists call Whidbey Island home. Artist studio tours and other events for artists and art lovers are held on the island throughout the year. Unique galleries are scattered around Whidbey Island for you to discover during your wanderings. Some of the best art galleries to visit include Penn Cove Gallery for fine art and crafts in Coupeville, Hunter Art Studio for its great selection of photography, and Hellebore Glass Studio in Langley. Deception Pass is the strait that separates Whidbey Island from Fidalgo Island—and it's best experienced from below. To do so, take a boat tour that begins east of the bridge and travels out into Rosario Strait. The scenery is magnificent, the wildlife is amazing, and the history is pretty darn compelling too. Along the open-boat tour, you'll have the chance to see blue heron, bald eagles, sea lions, sea otter, and—if you're really lucky—orcas. Fort Casey State Park has a lot to offer, so no matter what your taste is, you're bound to find something fun and interesting during a visit. It's home to the Admiralty Head Lighthouse, a picturesque structure that now serves as an interpretive center, with exhibits covering the lighthouse and the history of Fort Casey and Puget Sound's "Triangle of Fire," and historic gun batteries that are open for tours. Historic officer housing and barracks now serve as accommodations and meeting space for public and private events. 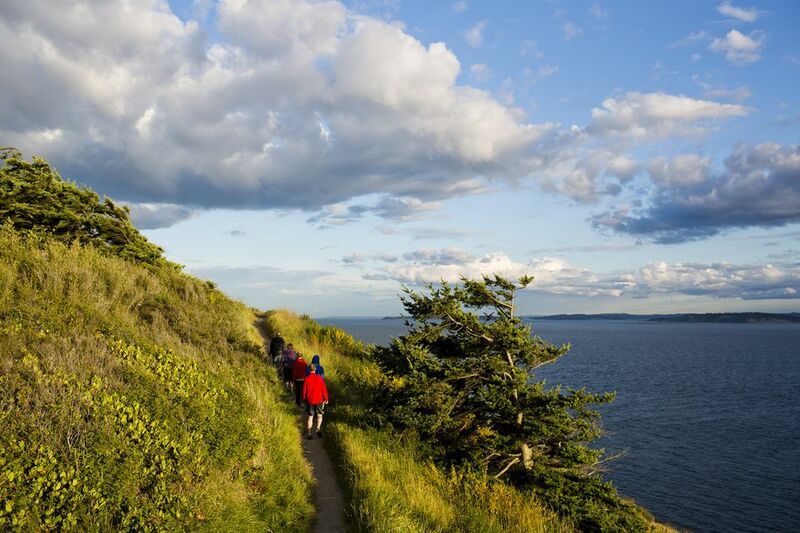 Whether you like a vigorous hike or a scenic stroll, you'll find many opportunities to walk and wander on Whidbey Island. Deception Pass State Park has more than 4,000 acres of hilly terrain and miles of trails, whereas trails at Ebey's Landing NHR run through the prairie and along a bluff overlooking Puget Sound. History buffs will enjoy the self-guided walking tour of Coupeville. Or visit Earth Sanctuary, a​ private nature reserve, for a self-guided meditative tour experience. Whidbey Island has a winding shoreline, resulting in interesting coves and harbors, but there are also several freshwater lakes on Whidbey Island where you can get out on the water for traditional activities. Marinas are located at Deception Pass State Park, Oak Harbor, and Langley. Boat launches can be found in many locations along Whidbey's shoreline, including Freeland Park, Possession Point County Park, Coupeville, Cavelero Beach, and Fort Casey. Scuba divers will enjoy the Keystone Underwater Park, the Langley Tire Reef, and the waters at Possession Point State Park. Great food and drink is an important part of any getaway and you'll find plenty of that: Most Whidbey Island restaurants have an incredible selection of fresh and unique ingredients. Local specialties include Loganberries and Penn Cove mussels, which can be had at restaurants like Frasers Gourmet Hideaway in Oak Harbor. At Coupeville's Oystercatcher, you can try the catch of the day served alongside seasonal vegetables, which might be something like fresh halibut, accompanied by new potato and zucchini pave, corn, fresh bean and cherry salad, basil vinaigrette, and pine nuts. You also have a chance to appreciate the local bounty at the several different farmers markets on Whidbey Island, as well as at one of the island's wineries or wine shops. Located in Coupeville, this museum is devoted to local history. Mammoths and their lives on prehistoric Whidbey Island are the subjects ​of one exhibit. Pioneer history and island transportation are also covered. Be sure to view their film about Ebey's Landing for a greater appreciation of the island's history. This 645-acre park on Whidbey Island was initially built as a coastal defense fort in World War II. While its original purpose didn't quite pan out, the park is now a popular recreation area, especially for camping. Even if overnights in the wilderness aren't your thing, Fort Ebey is also home to mountain biking and hiking trails, as well as miles of saltwater shoreline that is popular for beachcombing, fishing, and birdwatching.